Düsseldorf is a city in western Germany located on the banks of the Rhine River. It is populated by over 600,000 people and is an art and fashion hub. Düsseldorf is famed for its Old Town, on the east bank of the river, and its 13th century architecture including the St. Lambertus Church and the Schlossturm (Castle Tower). 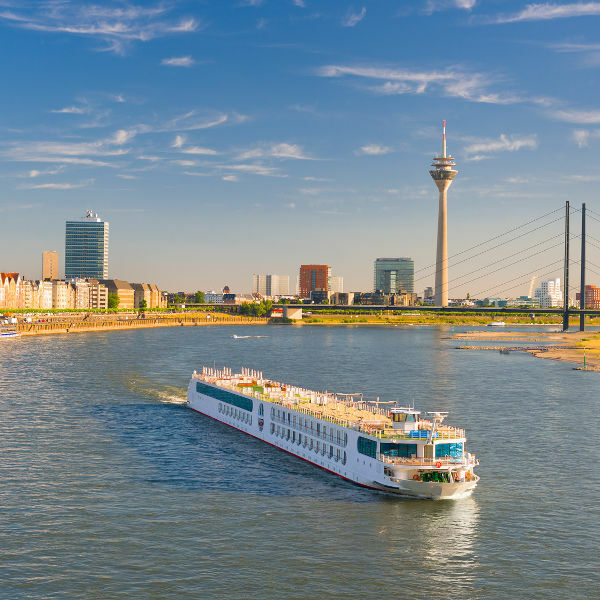 Cheap flights to Düsseldorf are now available for a limited period of time, so get ready to explore the streets of this beautiful city and its incredible art, culture and history! Düsseldorf is home to the Düsseldorf Airport (DUS) which is a 15-minute drive from the city centre. Across the river from the modern Düsseldorf, lies the nostalgic ‘Altstadt’. Visit the beautiful St. Lambertus Church, go shopping or enjoy a pint of Altbier at one of the many traditional pubs. The majestic Rhine River borders and beautifies Düsseldorf. Take a scenic boat tour and admire the city skyline, visit the neighbouring Duisberg or enjoy the spectacular festival fireworks in July. 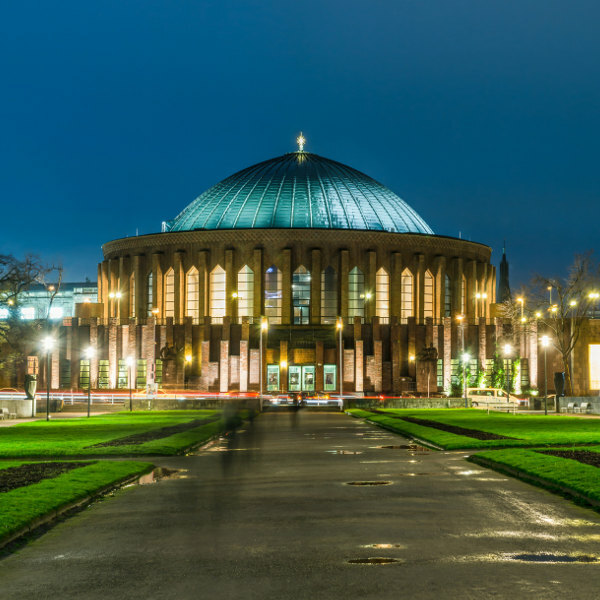 Explore the art, culture and fashion that Düsseldorf is known for, stroll through the Museum Kunstpalast, visit the Königsallee shopping district or catch a show at the magnificent Tonhalle concert hall. The best time to visit Düsseldorf is during the warm summer months of July and August. Although Düsseldorf receives frequent rain in summer, the pleasant temperatures attract visitors from all over. Sightseeing or enjoying the variety of annual festivals, like the Funfair that begins on July 14th and the Düsseldorf Gourmet Festival that takes place between 25-27 August, are perfect holiday activities. However, this is the peak tourist period in the city, so air fares, accommodation rates and general holiday costs are at their highest. If you can brave the cold European winter temperatures, the months between October and January are more affordable for a trip to Düsseldorf. You will find cheaper flights and accommodation as this is the off-peak tourist season in the city. This does not mean that your holiday will be less enjoyable. 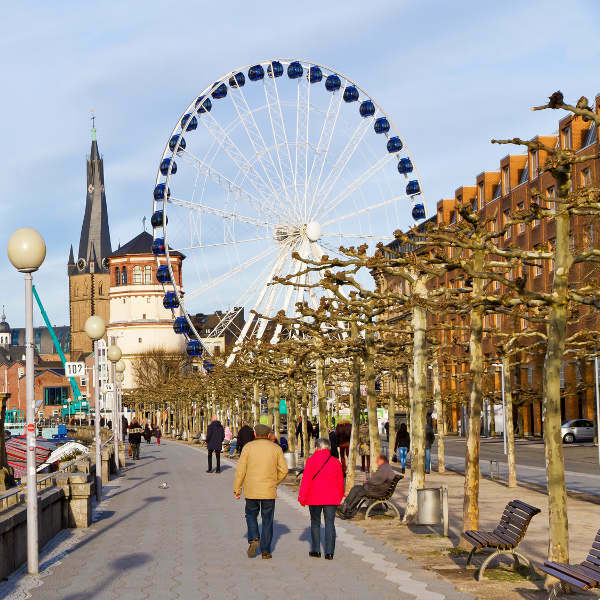 Düsseldorf has a vibrant art scene and a multitude of galleries that host exhibitions throughout the year, and annual events like the magical Düsseldorf Christmas Market, are open between November and December 23rd. Düsseldorf, a western German city located on the banks of the Rhine River, is a dynamic art, culture, fashion and nightlife hub. The city is famed for its Old Town on the east bank of the river, which was restored to its former glory after it was destroyed during WWII. The beautiful cobblestone streets boast 13th century architecture that includes the St. Lambertus Church and the Schlossturm (Castle Tower). For four days in February, usually between the 8th and 12th (and on November 11th) the city’s streets come to life as the locals celebrate the Düsseldorf Carnival. Join the locals for a few drinks at the incredible bars in Old Town, take part in their traditional events, like the Kö Treiben on the Königsallee, and enjoy the colourful float processions. Explore the Düsseldorf Media Port located in the docks just off the Rhine River. The promenade is lined by trendy media, design and fashion companies. There are many pubs, restaurants and popular nightclubs in the area that will keep you partying until sunrise. The view of the Düsseldorf skyline from the observation deck of the 240m high Rheinturm Tower is a must-see. You can also enjoy delicious pastries, top-notch traditional dishes and an amazing wine selection at the tower’s revolving restaurant. Compare several airlines and book your cheap flights to Düsseldorf online at Travelstart! Make sure your routine vaccines that include the MMR vaccine, DPT, Chickenpox, Polio and yearly flu shots are updated before travel. As an additional precaution, you should get vaccinations for Hepatitis A, B and Rabies, as you may be exposed to infected stray dogs and other mammals while on holiday. Düsseldorf is a fairly safe city, however, you should still practice normal safety precautions. Keep your valuables and important documentation safe and watch out for petty crimes like bag-snatching or pick-pocketing. Try to avoid the central train station at night and avoid getting into any confrontations at local bars and clubs.